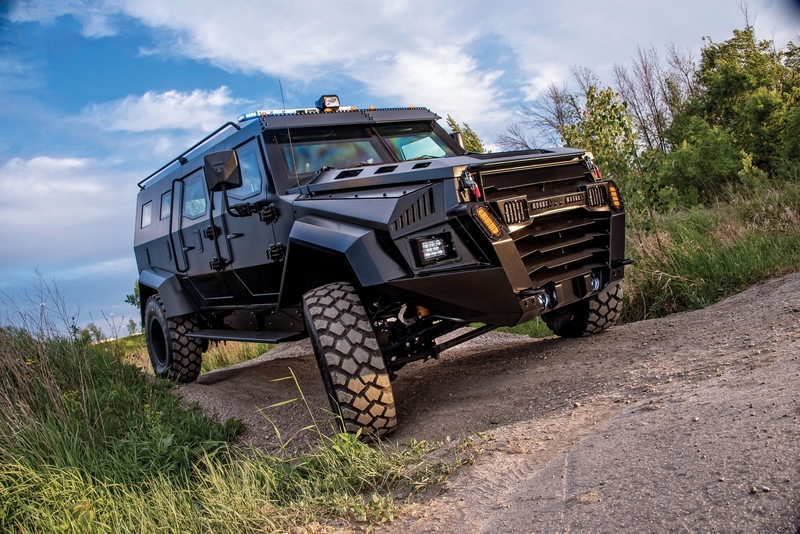 INKAS Armored Vehicle Manufacturing, a Canadian-based company specializing in the production of armored vehicles for private, commercial and military purposes, has introduced the INKAS Sentry APC, a tactical attack and defense vehicle designed to serve in extreme climate conditions. The new vehicle joins the extensive INKAS lineup of innovative APCs alongside its 16-passsenger flagship – the INKAS Huron APC. The INKAS Sentry is a unique APC in terms of technical specifications, design and assembly. A truly innovative approach was taken when designing the vehicle utilizing the best engineering solutions implemented in previous models. The new APC is characterized by a high level of off-road performance and maneuverability. With a heavy duty truck chassis, this vehicle remains reliable in the most demanding conditions, thanks to custom-designed components upgraded to provide increased weight capacity and reliability. The INKAS Sentry APC can be equipped with dual protective layers ensuring its passengers safety from both ballistic as well as blast attacks. The advanced armoring materials provide protection against 7.62×51 SC ammunition, 7.62×51 M80 NATO Ball ammunition and tested to meet NIJ-STD-0108.01 Level III as well as CEN Level BR7 ballistic standards. The new APC features perimeter armoring of the passenger compartment, engine bay as well as key mechanical components. The vehicle is equipped with multi-layer ballistic glass and INKAS proprietary overlap system to protect from bullets being shot between seams of doors. The vehicle provides a high level of protection and comfort to its passengers in any climate condition from extremely low temperatures to tropical heat waves thanks to the extra layer of cabin insulation and smart ventilation system. The vehicle’s configurable seating arrangements allow its occupants to efficiently operate the vehicle while maintaining tactical positions. The INKAS Sentry APC is designed to be used by military forces, SWAT, and other law enforcement agencies all over the world. Among other security features, this model can be equipped with an escape hatch, siren/PA system, emergency lights package, electronic military system as well as external view cameras providing 360o F.O.V. The vehicle can be customized according to the client’s requirements and serve as a mobile command centre or a medical evacuation vehicle as well. “We are proud to present the INKAS Sentry APC, an innovative, cost-effective and fully customizable solution for peacekeeping operations. We believe that the new vehicle along with its bigger version – the INKAS Huron – will be one of the most popular models in its range thanks to its design and quality which fully complies with the actual needs and requirements of our clients”, says David Khazanski, CEO, INKAS Armored Vehicle Manufacturing. The new vehicle has been fully designed, engineered and built at the INKAS manufacturing facility in Toronto, Canada. Since 2014, INKAS has relocated its production capacities from the UAE to Canada in order to centralize its operations and boost quality of its products for both military and civil markets.